INTV Advanced Dungeons & Dragons: Treasure of Tarmin in 00:56.59 by TheWinslinator. Advanced Dungeons & Dragons: Treasure of Tarmin was the second licensed AD&D videogame on the Intellivision. The gameplay involves exploring a series of randomly generated mazes searching for weapons, armor, treasures, and magical items to battle a wide variety of monsters RPG-style. 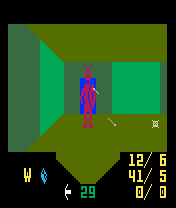 The game was released in 1982, meaning the 3D dungeon crawler perspective was very innovative for its time. TheWinslinator uses an absurd amount of luck manipulation to breeze through the 12 chambers, defeat the Minotaur, and collect the Tarmin Treasure in under a minute. If you're itching for more Advanced Dungeons & Dragons we also have a run for the first title Cloudy Mountain.